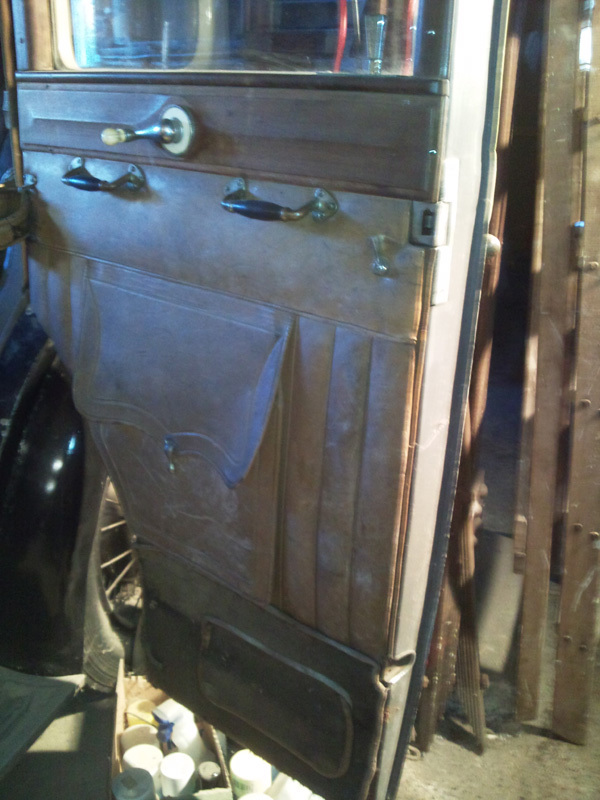 Some eight or ten years ago my friend and fellow Daimler enthusiast, Fred Williams went to look at an old Daimler saloon that was for sale locally. He made an offer which was deemed too low and the car remained unsold. Recently, through a third party we learned that the owner was having a clear out and the car had to go. Fred was no longer interested as he had other projects but knew that I was very keen on this type of car. I telephoned the vendor who had owned the car for nearly 40 years, and made an appointment to view it, the LQ2-20 was everything that I wanted, big enough to be imposing, but not too large and unwieldy to fit in the garage, vintage in appearance but modern enough to be useable, and perhaps most importantly unmolested and almost completely original. 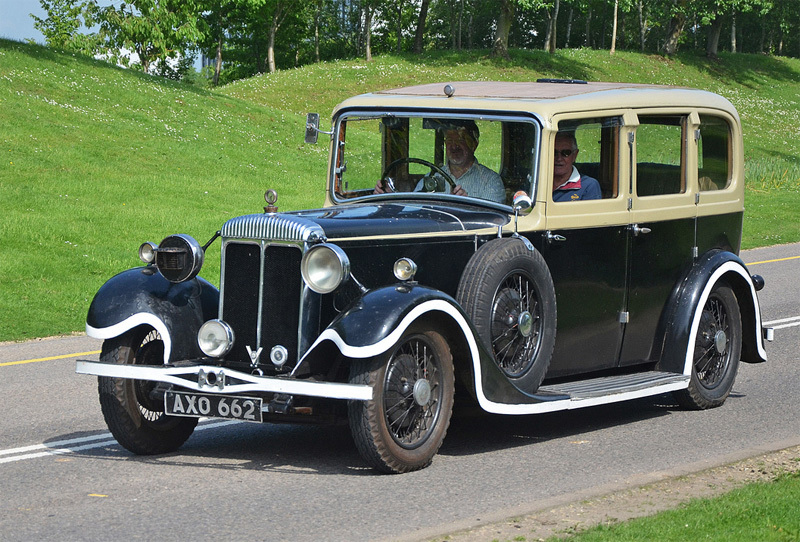 Although this car has a division, it should not be thought of as a limousine, it is built upon the saloon chassis and has a longer scuttle, and lower rake to the steering column than the LQ3-20, which was designed by Daimler to accept the more formal style of limousine coachwork. Most limousines, even large ones, have very limited space in the driver’s compartment (if you intend buying any limousine I urge you to drive it first, you may be unpleasantly surprised at how upright and uncomfortable the drivers seat can be). Some huge 8 cylinder Daimlers cannot be comfortably driven by anyone over 5’6″ tall, this car however was constructed with a 5’10” individual in mind, the driving position is perfect for my size and style of driving. First time out on the road for over twenty years! A deal was struck and a few days later I recovered the car using a heavy duty car trailer. 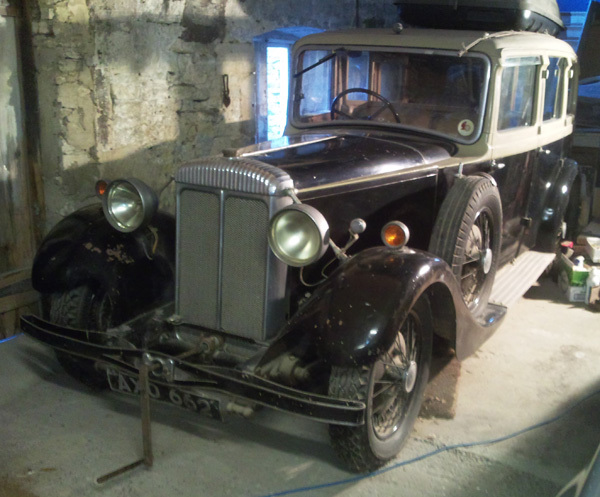 Once home I thoroughly cleaned the Daimler, it had been stored in a coach house, come workshop, the previous owner was a keen carpenter and the limousine was covered in saw dust, both inside and out. Having cleaned the car I set about starting the engine, a simple service, and a fully charged battery, soon had the car running. Before I could drive it, I had to replenish the fluid flywheel, after twenty years of standing idle, a slight drip had emptied it to the point where the car would not move under its own power. Several weeks on, having greased the flywheel bearing, the flywheel is showing no signs of leakage. 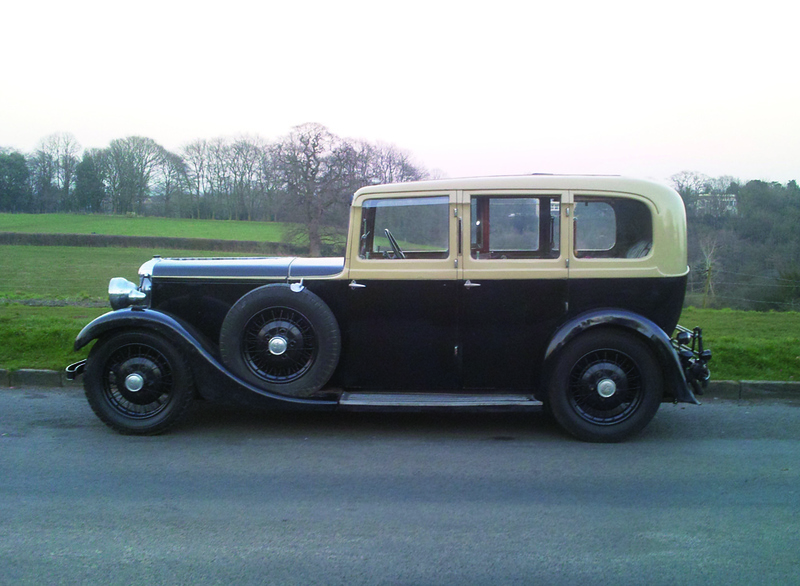 I was now able to take a test drive, the Daimler drives beautifully, the engine has that typical, lazy, low down torque that these large Daimlers are famous for, allied to the fluid flywheel it provides a tremendously smooth driving experience. The gearbox has that beautiful hum in neutral that drivers of these cars will be familiar with, the steering is light on the move and the brakes are typically excellent, in this case Lockheed hydraulic with servo assistance, modern car drivers would be amazed at their efficiency. Restoring this lovely old car would spoil it, I plan to preserve it in its original condition, this does not however mean that I shall do nothing to the car. I have already removed several yards of extra wiring which had found its way into the engine bay, and rerouted other wires which were running all over the place. I plan to make it fully roadworthy and efficient and get everything that is fitted to the car operating correctly. The interior wooden trim was crying out for attention, the protective layer of lacquer had long ago lifted off, water ingress and greasy hands had badly stained it in places, and there was some evidence of woodworm. So far I have removed all of the trim, cleaned it down, treated it with wood cleaning solution and a wood renovator. Once happy with the appearance, I filled the worm damaged areas and ‘touched in’ the repairs with wood stain. I then applied 3 coats of satin exterior grade varnish, flatting off with 1,000 grit between coats. This finish is not too ‘glitzy’ and I am pretty sure is close to the original rather conservative finish. I have also carefully repaired numerous damaged sections of leather trim by simply gluing or tacking them back in place, it is surprising what a difference this, combined with a good clean, can make to the appearance of a scruffy interior. The rear seat had several small rips and a couple of large, unsightly tears, these I tackled by gluing in backing pieces which were then ‘filled’ with a leather repair compound. Once cured, I coloured the compound using ‘Warhammer’ water based paint, dry flecked with black to help blend it in, later on I dabbed these areas with a sealing fluid. Once dry the small repairs are invisible, and the large ones are lost to the eye unless the leather is closely inspected. The overall improvement has to be seen to be believed, when purchased, the seat looked to be suitable for scrap only. The leather compound is available on line, if your old car has damage to the leather, have a go at repairing it before consigning it to the rubbish bin. I personally prefer ‘original but worn’ to bright shiny, new leather, especially in a pre-war car, and believe that even visible repairs, if carried out carefully and sympathetically do not deter car’s appearance. Nowadays with so many ancient cars looking like new, I think it is time to stem the flow and preserve these old cars as you would a piece of antique furniture. The entire floor covering and the carpet trim from the bottom of the drivers door was missing, having long ago been thrown away. I have chosen a high quality golden coloured carpet, which is a good match to the original (although a lot brighter in appearance). I have cut the carpet and carefully bound the edges by hand. This is time consuming, but usually carried out whilst sat in front of the T.V., on an evening when the cold garage is a bit too uninviting! The existing carpet on the lower door kick trim and at the lower sections of the seats was very dirty, using a household product I have gently cleaned them and the result is very pleasing. The interior of this car now has the look of a well used gentleman’s club, it has a fantastic aroma, real leather, wool and varnish, along with a hint of hot oil! I believe that this car when new was purchased as an ‘owner driver car’ with a chaufeur hired as and when required for special events, the fact that the driver’s compartment is spacious and as luxurious and as the rear ‘lounge’ area adds evidence to this theory. 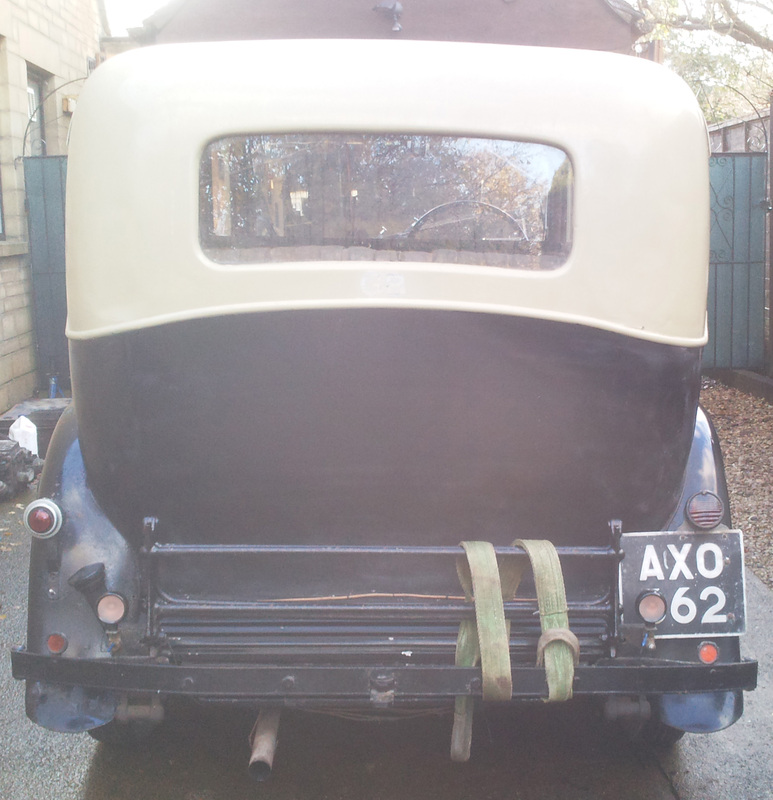 The large luggage rack is a useful feature on a car with no boot! The Daimler LQ 2-20 has a 2.7 litre ohv engine, with a detachable cylinder head and Wilson pre-selector ‘self changing’ gearbox with fluid flywheel. The LQ 2-20 and the similar LQ 3-20 both have a 10′ 4″ wheelbase, the difference between the two models lies in the length of the scuttle, the 2-20 has a longer scuttle and correspondingly shorter body and was designed for saloon coachwork, whereas the 3-20 was intended to carry the more formal limousine body. Also available as a chassis, the individual buyer could of course instruct a coachbuilder to build whatever style of body he fancied. The first owner clearly had a good eye for a motor car, it is extremely well proportioned and is not as staid in appearance as other LQ models. Although fitted with the modern self changing gearbox and the latest poppet valve engine, when launched in 1934 this was not an all new model. Daimler’s move to the cruciform chassis did not reach as far as the LQ 2-20. This model retained the old ladder frame chassis, and was a direct development of the LQ 16-20 which was fitted with a sleeve valve engine and pre-selector gearbox, this model in turn, was almost identical to the earlier LQ 20 which had the sleeve valve engine and ‘crash’ gearbox. Decidedly vintage in appearance, with its tulip shape front lamps and partially open front wings, the Daimler would have been a very impressive, although rather old fashion car when it was new, it is similar in appearance to the succesful Daimler 15, but quite a bit larger, closer in size to the Rolls Royce 20. The interior is delightful, with ‘saddle bags’ on the back doors, small compartments concealed behind flaps in the carpeted sections on all four doors, roller blinds fitted to the rear side and back windows, a locking document box, writing table and a sliding tool tray situated beneath the front passenger seat. One of the great delights of this type of vehicle is the discovery of all of the special features not usually found in a motor car; a large storage box beneath the floor on the rear passenger side, with similar compartments below the rear passenger and the driver’s seat, a pipe holder, scent bottle and note book holder carved into the woodwork are the most interesting. The woodwork is fantastic, a lovely golden colour and plenty of it, I hope Salmons, the coach builders, had an environmental policy where they replaced the trees used to decorate the interiors of these lovely old cars, they must have cut down forests full of them! The headlining has decorative piping and ribbon around the edges, with roof netting made in a matching cord. A switch mounted on the dashboard has a mechanical clockwork action which allows the semaphores to self cancel, a feature that I have not come across in any of the ancient cars that I have previously owned. Plenty of legroom and beautiful woodwork. 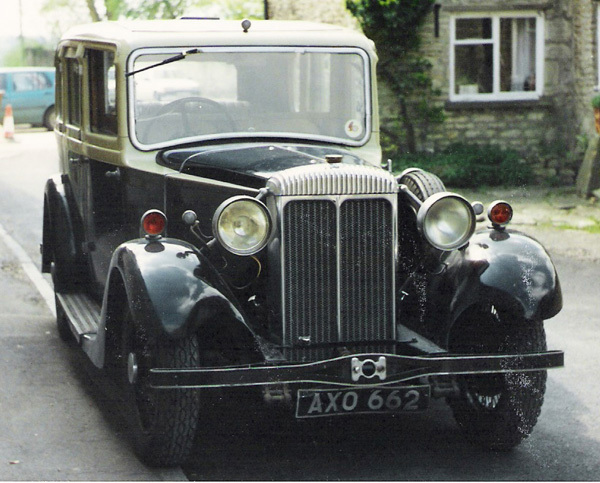 According to the Salmons expert and author Dennis Mynard, this is one of only a few Daimler saloons or limousines ever built by the Newport Pagnell firm and the only one on this chassis. I am intrigued by the roof mounted lamp which appears to have been fitted from new, the wiring is concealed behind the headlining and screen trim and runs to a period junction box mounted on the toe board on the passenger side, which also supplies the windscreen wiper motor. 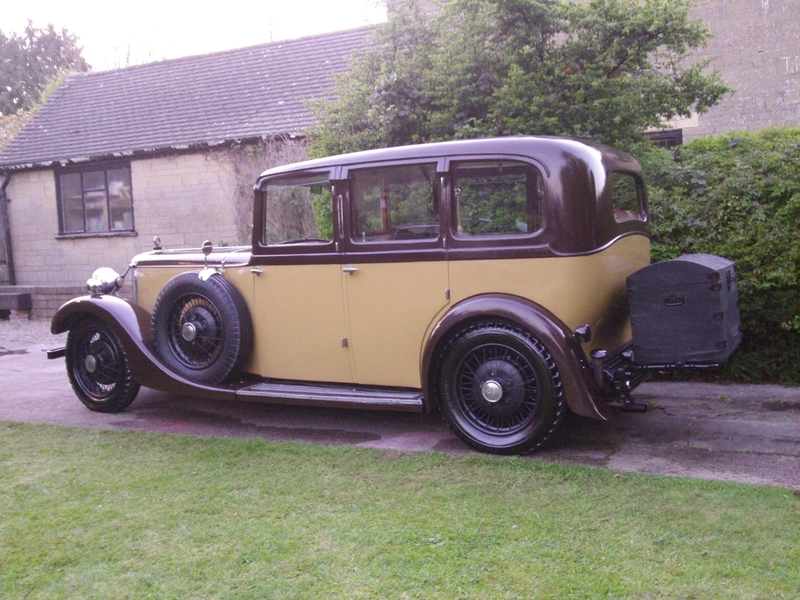 The coachwork is constructed to a high standard and is certainly as good, although not as large, as that fitted to the EL24 Charlesworth limousine that I have previously owned. Having now owned the Daimler for some time, I have discovered what a delightful car it really is, I am particularly impressed with the ease of access to the grease points on the front suspension and steering, which are readily accessible through the ‘cutouts’ in the front wings. Rear lubrication points are accessed remotely from the battery tray situated in the rear compartment. All of the areas requiring lubrication have been treated to a couple of grease or oil applications and the engine has had an oil and filter change, the Daimler is noticeably smoother and the steering lighter and with more ‘feel’ than experienced on the first drive. Serviced and running nicely, February 2013. Having run the car for a few miles, several faults came to light, a misfire, which I at first put down to oiled plugs, due to frequent use of the choke, turned out to be the result of a couple of seized valves. The cylinder head was removed, valves freed and lightly polished, the water jacket cleaned and flushed through and a new cylinder head gasket fitted. One huge advantage of carrying out this task was the ability to inspect the bores and valve gear, which all look as good as new. The brakes were not responding as they should, investigation revealed that a couple of brake cylinders were also sticking, these have now been cleaned down, new rubbers fitted and the system flushed through with new brake fluid. The interior of the car has received a lot of attention, the missing glass division has been replaced and a new carpet cut and bound, numerous rips and tears in the leather and head lining have also been repaired. The car has now been given a proper road test, through the heavy traffic around Bristol City Centre, then out towards Somerset on lovely clear, open country roads, the Daimler did not falter, it is beautifully smooth and extremely pleasant to drive. Now that virtually everything works as it should, I have turned my attention to the exterior, I have given the paintwork a polish and touched in numerous areas where the paint had chipped or flaked off, although still scruffy, the difference is remarkable as can be seen from the photograph below (I have to admit that the paintwork photographs well, the brush marks are invisible!). Washed and polished – a huge improvement! 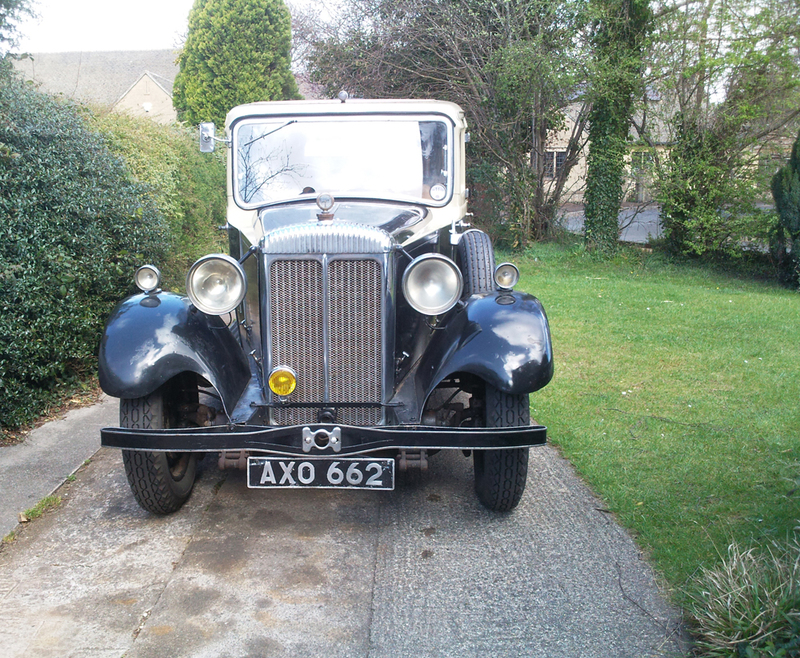 A delightful Daimler, one of the best I have owned. Having made numerous short journeys and as many minor adjustments, I have been awaiting the opportunity to take the Daimler on a proper run. 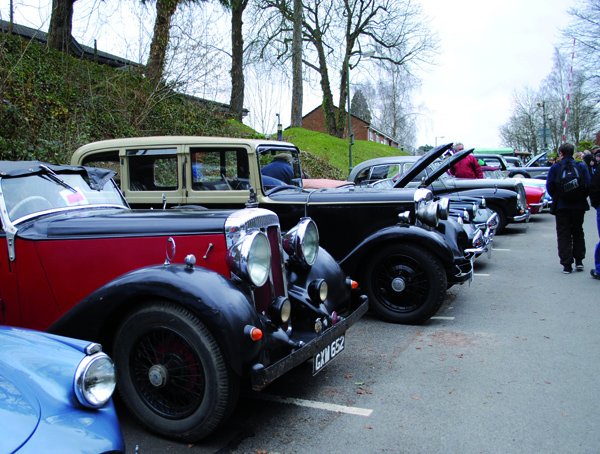 Easter Monday is the regular date for the Coleford Festival of Transport. The DLOC have had a presence here for many years and several of the cars featured on this web site have made the journey to the Royal Forest of Dean to participate. The morning was dry but very cold, with a full tank of fuel, a thermos flask and some cash for the Old Severn Bridge toll, I set off with that gentle feeling of pleasant anticipation which always accompanies the first few journeys in a recently recommissioned motor car! The car went very well, smooth and sedate progress was made along country roads to Aust where I joined the motorway for the river crossing, before returning to the quiet road to Coleford. Although arriving in plenty of time there was already a nice selection of Daimlers and a pretty Lanchester LD 10 in place. A very pleasant day was spent amongst like minded enthusiasts before the return journey was made, just over 70 trouble free miles were covered at varying road speeds, but the day was very cold, so not necessarily a particularly good test of the cooling system! 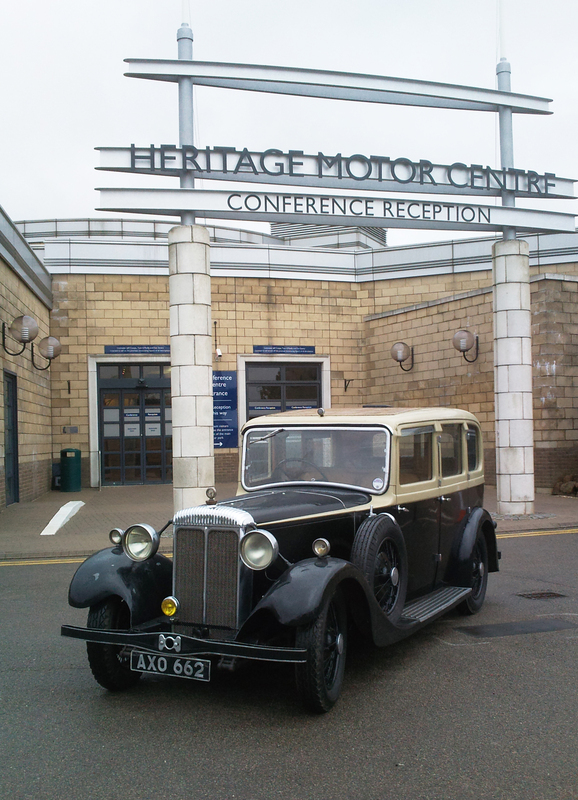 The Daimler & Lanchester Owners’ Club held their spring conference at the Gaydon Heritage Centre in Warwickshire on Saturday 13th April 2013. 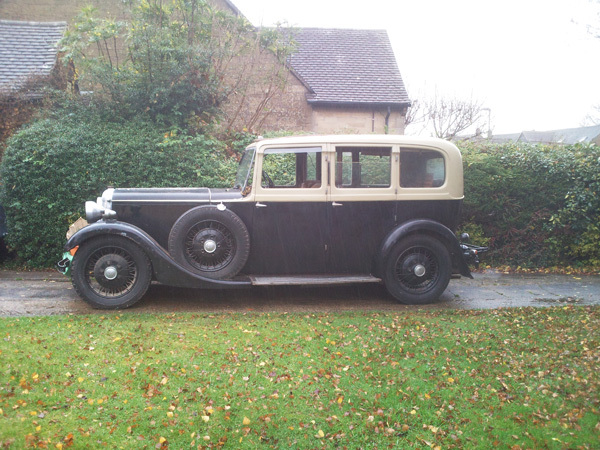 Although the weather forecast looked unpromising I decided to drive there in the Daimler. I set off for the Fosse Way and experienced fog, rain and high winds before arriving at the museum. The LQ2-20 performed perfectly, it did not miss a beat, but happily cruised at a steady 50-55 mph, the seating and springing in this car allied to its long wheelbase make for a very comfortable ride and I was surprised at how I often glanced at the speedo’ to see the indicator nudging 60 mph. After the conference I set off in the rain and headed for Bristol, despite the worsening weather the old Daimler just purred along, making short work of the miles. My windscreen developed a leak through one of the wiper mounting fixings and a small river ran down the inside of the screen, irritatingly right in the centre of my eye line, I was able to wipe it away, but it became a constant task and will require attention prior to venturing out again. Just over 170 miles covered without a hitch, a pint or so of water required in the radiator and probably around 1/2 pint of oil. As I drove the Daimler into the garage the sky cleared and the sun came out – you can’t win them all! Gaydon 2013, first proper journey 170 miles without incident. 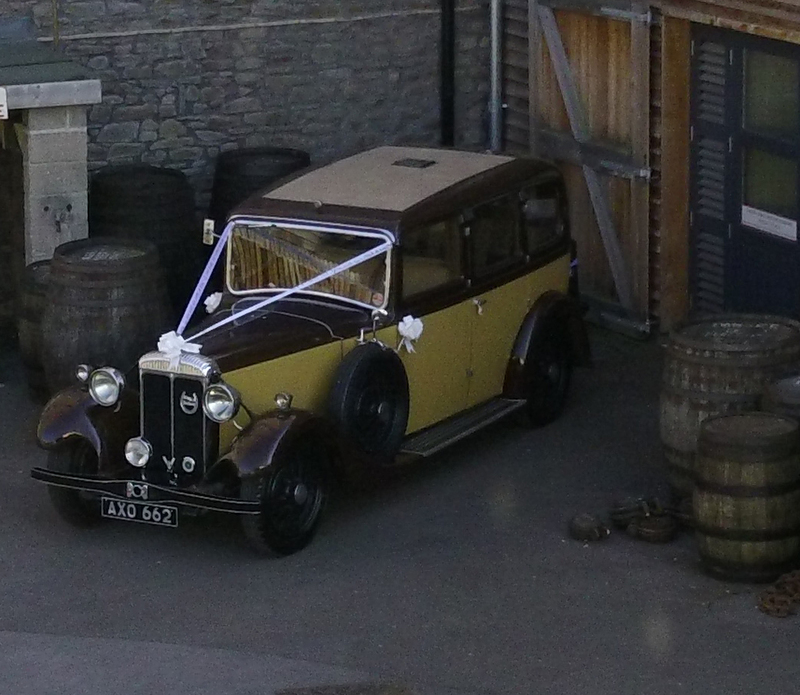 The Bristol Classic Car Show at Shepton Mallet took place over the weekend of 20/21st April 2013. I intended to use the Daimler as the works hack, running the exhibition equipment to Somerset and giving various participants in the event lifts to and fro. I left Frenchay for the Royal Bath & West Showground at 1030 and enjoyed an easy uneventful 26 mile run. After setting up the DLOC stand, I drove my friend Clayton Spear home to Weston Super Mare. The car faltered and to our great surprise cut out twice, we managed to restart it, convinced that the carburettor was suffering from fuel ‘vapourisation’. Before leaving Weston for Frenchay, I re-routed the petrol supply pipe away from the rear of the cylinder head and ran it along the fire-wall. The car ran well until I arrived in central Bristol, where heavy traffic and many red traffic lights caused me to tense up, the Daimler felt the vibe’s and again faltered and cut out several times. On each occasion I managed to coast into the kerb, I then jumped out, raised the bonnet side panel, removed the float chamber ‘lid’ to allow the fuel to flow, then jumped back in, restarted the engine and got the car back out into the traffic. Only once did a fellow motorist lose patience and operate his horn. I nursed the car to within a mile from home when it finally gave up the ghost and despite my best attention would not restart! Tired and frustrated, I called my wife Melanie and submitted to an ignominious tow home on the back of the people carrier. 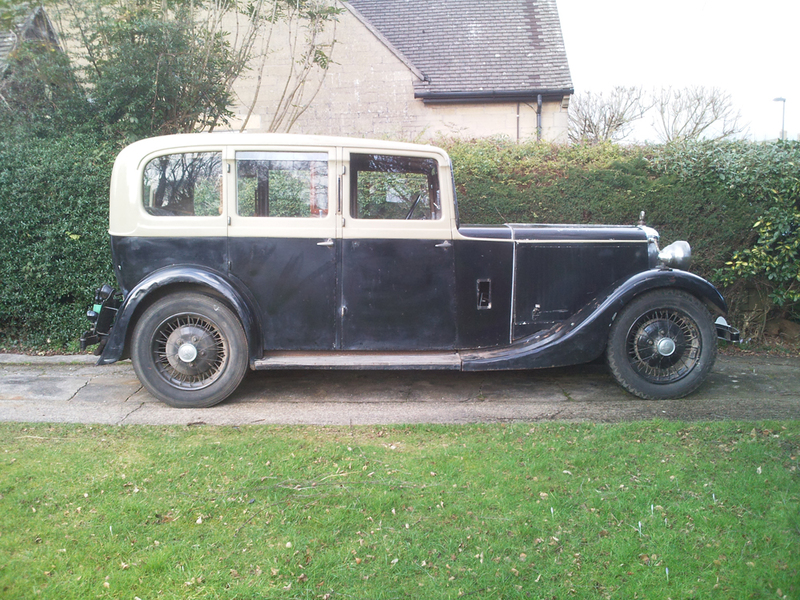 It was too late in the day to make repairs and the Daimler was left on the drive overnight. Saturday’s journey was made in the modern car but after the show I managed to spend an hour investigating the fault. I had previously fitted a new rubber tipped nylon needle to the valve in the carb’s float bowl, this was sticking in the closed position preventing the fuel from flowing into the float chamber. I replaced this with an old fashioned valve with a stainless steel needle. I now had a good fuel supply but the engine still refused to start, a quick check showed there to be no sparks. I plumped for the coil first and replaced it with one I know to be good. The Daimler fired up and ran perfectly. An unusual event, 2 faults giving similar symptoms occurring at the same time! 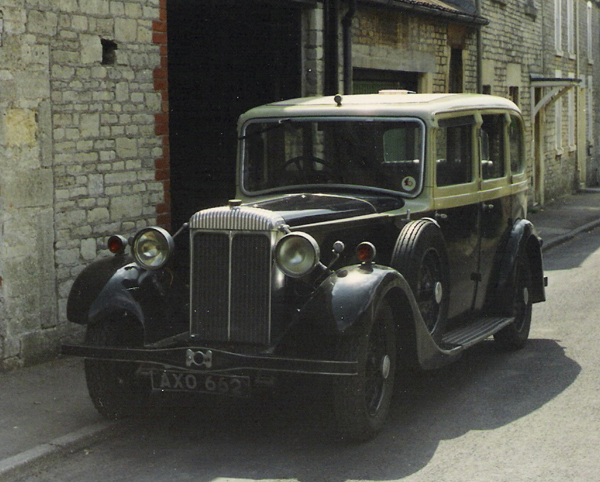 Sunday was Drive It Day, but I did not feel very happy about making the run to the Bath & West Showground in the old car as I was acting taxi driver, discretion being the better part of valour, I again chose the modern car for the drive to and from Somerset. I did however park the Daimler out on the driveway for the neighbours to admire. The limousine had at some time in the past been fitted with a drivers screen pillar mounted mirror, the old screws were all that remained, the mirror presumably having been removed to be fitted to another car. I was keen to find a suitable replacement, but was reluctant to part with the sort of cash these parts now change hands for on e-bay. New replica mirrors are available (for about the same price as old used ones), but the bright shiny chrome would simply look out of place on this old car. Whilst searching in my garden shed for some parts for another car, I came across one of these very mirrors, I must have bought it years ago at an autojumble for another car and had completely forgotten it. The well used mirror was a perfect fit, its fixing plate aligning perfectly, the existing old screws were even used to fit it in place! With the Daimler & Lanchester Owners’ Club International rally looming, I have been making running adjustments and minor improvements in readiness for the run to Shrewsbury. 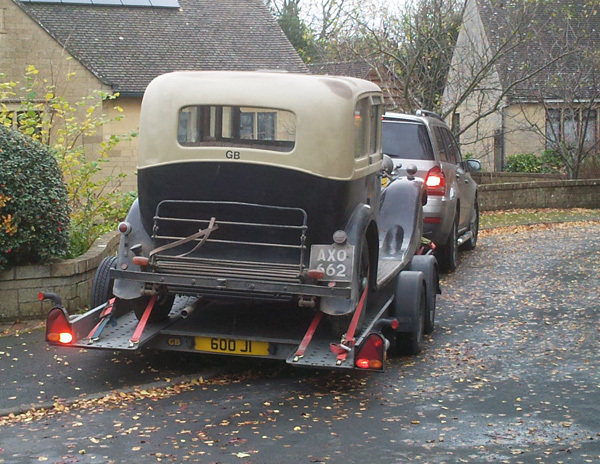 One drawback with the ‘D’ back coachwork on this type of car is the lack of luggage space, to overcome this, most owners fit a box to the luggage rack. I have been looking out for a nicely patinated one, but as yet have not seen one that fits the bill. To fulfill this requirement, I have temporarily fitted an old wicker basket previously used as a blanket box. I have covered the lid with leathercloth this will hopefully make it shower proof, although I am well aware that it won’t be weather proof. The basket is large enough to hold my folding chairs, light luggage and all of the paraphernalia that finds its way inside the rear lounge. This little job has made a huge difference to the appearance of the car’s interior, for the first time since I have owned the car it is clear of muddles! The DLOC International Rally took place at Quarry Park, Shrewsbury on Sunday 9th June. I set off at lunch time on the Saturday and cruised at a steady 50 mph along the A30, A417 and A49. The roads were virtually deserted in places, the upright driving position allowing for an excellent view of the road ahead and over the hedges to view the passing country side. A stop for coffee was made at a convenient garden centre, I took the opportunity to check the oil and water, but none had been used. The hotel we had pre-booked; The Corbet Arms at Uffington, was excellent, spotlessly clean, with comfortable rooms and excellent food. The following morning I enjoyed a gentle drive to the Park which is in a stunning position alongside the River Severn and parked up with the other 210 Daimler, Lanchester and BSA motor cars on display. An excellent day, with wall to wall sunshine and great company ended all too soon. 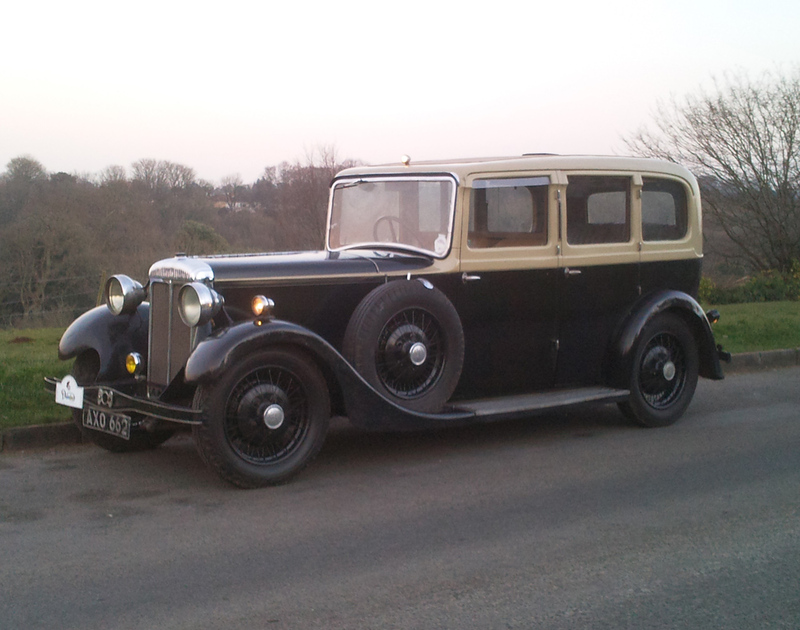 The return journey was as trouble free as the drive to Shrewsbury, the Daimler simply purred along, covering the distance in a dignified, unruffled manner. 250 trouble free miles were covered during the two days, a pint of oil and a couple of pints of water were consumed and of course quite a few gallons of petrol. I seldom calculate the fuel consumption, the certain knowledge that the car uses a lot of fuel would only spoil the enjoyment! The Daimler performed without fault and attracted considerable attention, hardly surprising, it was probably the scruffiest car there! June 2014 – To commemorate the 70th anniversary of the D-Day landings I have painted white lines around the wings and running boards and added a headlamp deflector, these were requirements imposed during the Second World War for all cars being driven at night during the conflict. The LQ2-20 has proved itself to be a lovely comfortable and reliable car, although a couple of issues have arisen, first off the starter motor failed, luckily I had the remains of a second motor and was able to build one good one from the two. Access to the ancillaries on this type of car are really very good, the motor was off the car and on the bench in around ten minutes, try and match that on your modern car. On a long motorway run to Shelsley Walsh (I don’t usually take the motorway in these old cars, bu the alternative route was so much longer), the radiator threw its contents out of the overflow, although the engine did not actually overheat. On my return I stripped the water pump and checked it over and removed the radiator. I found several of the cooling tubes were blocked, these were all thoroughly cleaned and the radiator rebuilt. The radiator tanks have a total of eighty securing nuts and bolts or studs, they can only be turned one flat at a time, removing them was a full days work, replacing them took the same time! Just days before the DLOC International Rally at Gaydon. 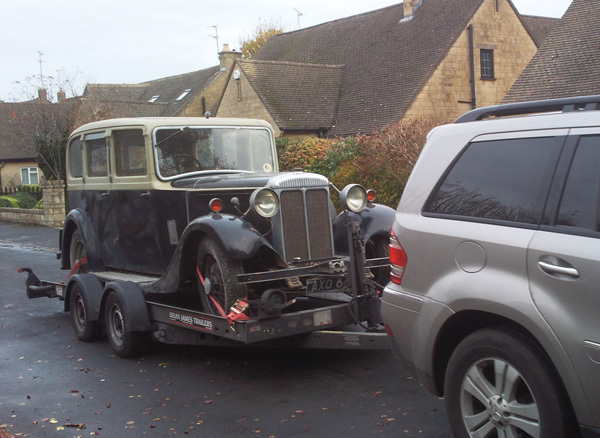 Since the repairs the Daimler has been used for local journeys and the run to the Daimler & Lanchester Owners’ Club international rally at Gaydon. I travelled on the Fosse Way cruising at around 50mph when the road conditions allowed. After a minor modification to the radiator’s overflow tube the cooling system operated as it should. The return journey was made during the hottest part of the day and the car remained cool whilst running and on tickover. Minor adjustments to the gearbox and the addition of a remote lubrication point for the brake servo have subsequently been made. After every long journey one or two minor issues seem to come to light, these are promptly attended to and bit by bit this already lovely touring car gets even better! 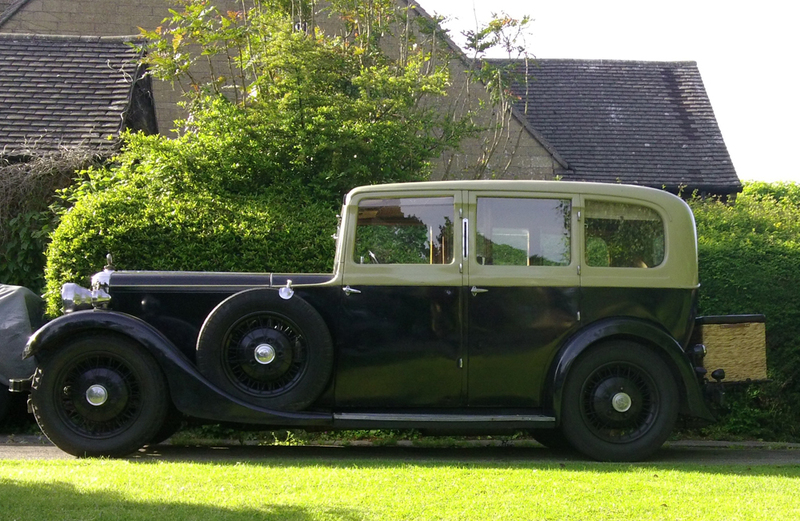 At the beginning of the year, my son and his partner of ten years, announced that they were planning to get married, and asked if I would drive them to the ceremony in my old Daimler. My wife immediately objected, pointing out that the car looked a shambles with its numerous dents, battle scars and flaking brush painted finish, (described by my neighbour as ‘looking like woodgrain’). 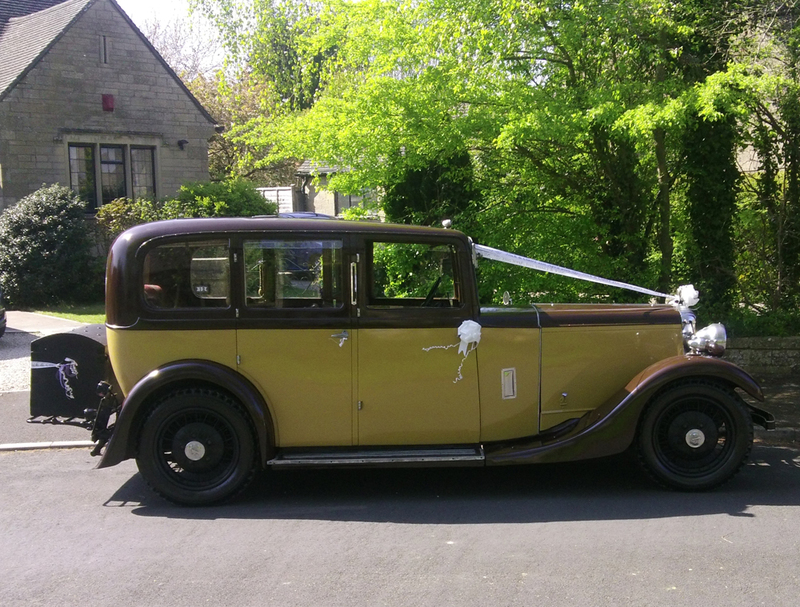 The wings were edged in white paint, to replicate wartime lighting regulations and I reluctantly agreed that the car did not really suit bridal duties. I was not to be deterred though, and assured them that I would have plenty of time to repair the coachwork and paint the car. 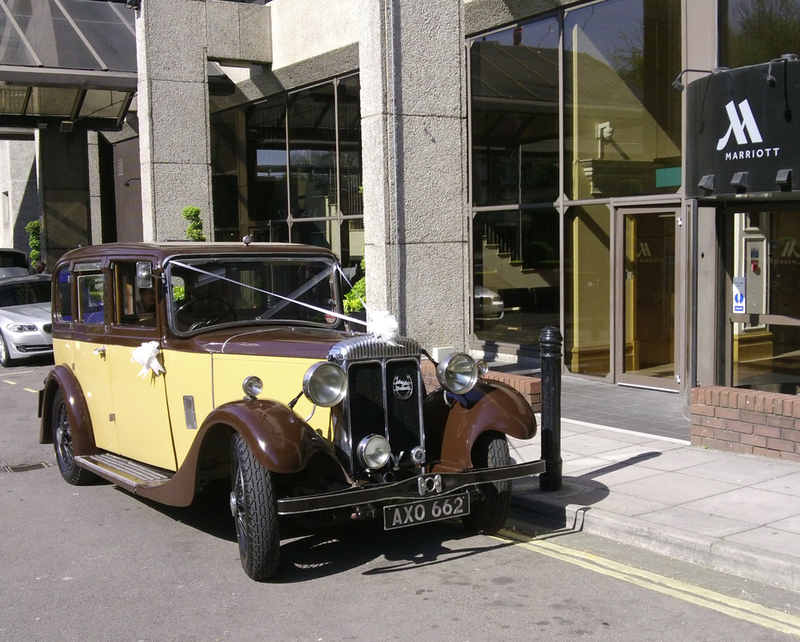 It was at this point that I was told that the wedding was being planned for April, giving me just over 3 months to get the Daimler spruced up. Another fly in the ointment was that the engine could not be started other than with a handle, and sometimes this method was a little hit and miss! The services of an auto electrician in Kingswood in Bristol were sought, after many broken promises, I retrieved the untouched motor and took it to DH Day in Wroughton, where the motor was promptly and efficiently repaired. Paint still wet – one day to go! The paintwork took a little longer, a couple of small blisters near the sidelamps on both front wings were prodded, previous repairs using fibreglass filler fell from the car, taking plenty of ferris oxide with them. Curved steel repair sections were fabricated, ready to be seam welded in place. Other sections were made to repair the nearside rear wing and the area adjacent to the rain channel in the front offside wing, these new panels were seam welded in place using a mig welder. The weld repairs took less time than the fabrication of the repair sections. The rest of the car was remarkably free from corrosion, although many dents were filled, flatted and filled again. As the big day drew closer, the weather became unseasonably warm, this had a dual effect on the painting process, which incidentally had to be carried out in the open, on my driveway, as the Daimler is simply too large to work around in my relatively narrow and overfilled garage. Warm, long days provided me with more time to progress the task, but when I was ready to get the coach paint out, the temperature was too high to allow the paint to run off the roller and flow as it would have done in a slightly cooler environment, I am not complaining, if it had been raining, I would not have been able to paint the car at all! With just days to go I painted the car in high build primer, followed by a coat of synthetic coach enamel, applied with a B&Q mini roller, the bonnet top sections were the exception, I had removed these to my small workshop and had worked on them and the numerous lamps, brackets and so on, when the weather was not good enough to work outside. Time had caught up with me and with just two days left before the wedding, the bonnet top panels were still in bare aluminium, I gave them a light coat of etch, but simply did not have time to add a coat of high build primer. I bit the bullet and rolled on a generous coat of coach paint, it went on nicely and initially looked almost perfect, but unfortunately has since ‘sunk’ in places and will require more attention. 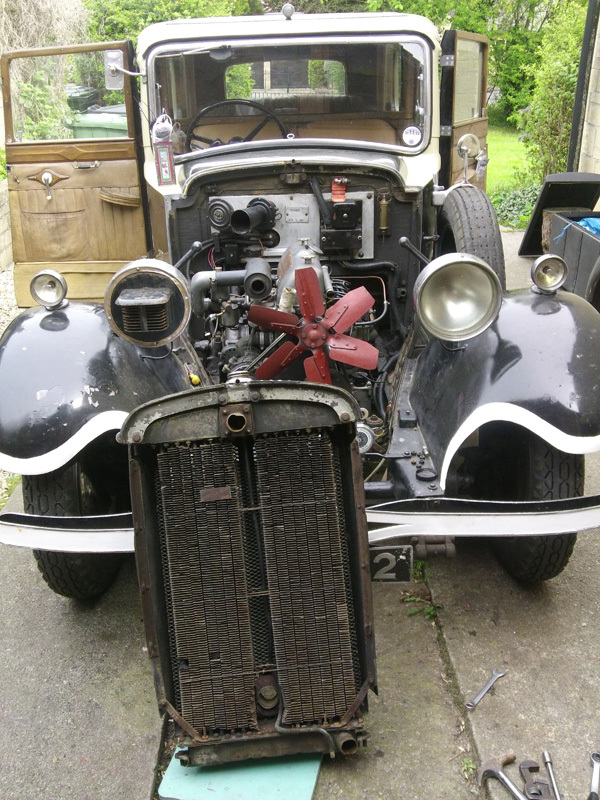 The following morning I refitted the bonnet to the car, attached the lamps, handles, mirrors, running boards and various bits of trim, all of which had been cleaned and painted. 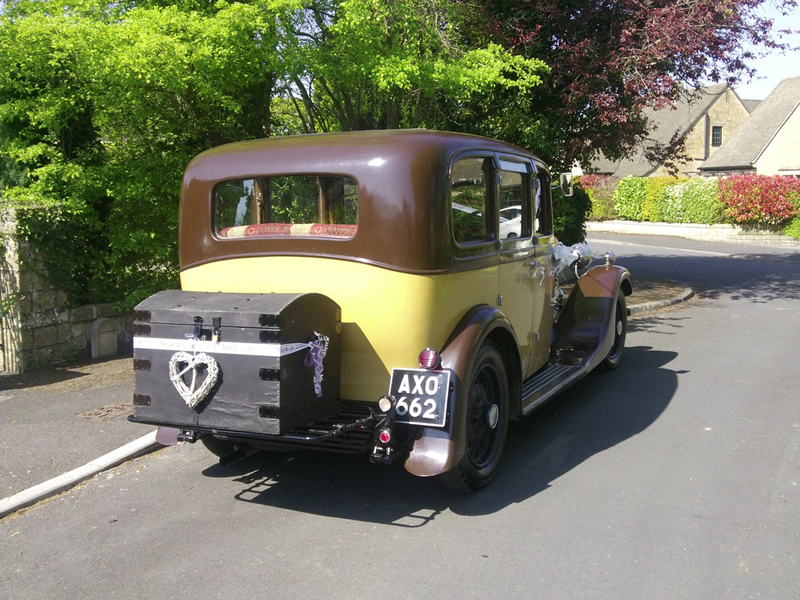 The car looked lovely, and on the morning of the wedding, still smelling strongly of fresh paint (synthetic coach enamel has an aroma very much like Dulux Gloss), I carefully affixed the ribbons, horseshoes and rosettes that make a wedding day car look special. The ceremony took place in April in the late afternoon at the SS Great Britain, getting there involved a drive through rush hour traffic, stop start all of the way, and despite it being only half way though April, the weather was positively warm. My eyes barely left the temperature gauge, and like the ignition lamp, I was glowing – even with the front screen ajar. I need not have worried, the Daimler took the journey in its stride, received a compliment from the battle hardened doorman at the Marriott Hotel, where the bride and groom were staying, and a huge round of applause from a coach load of French tourists upon arrival at Brunel’s SS Great Britain. 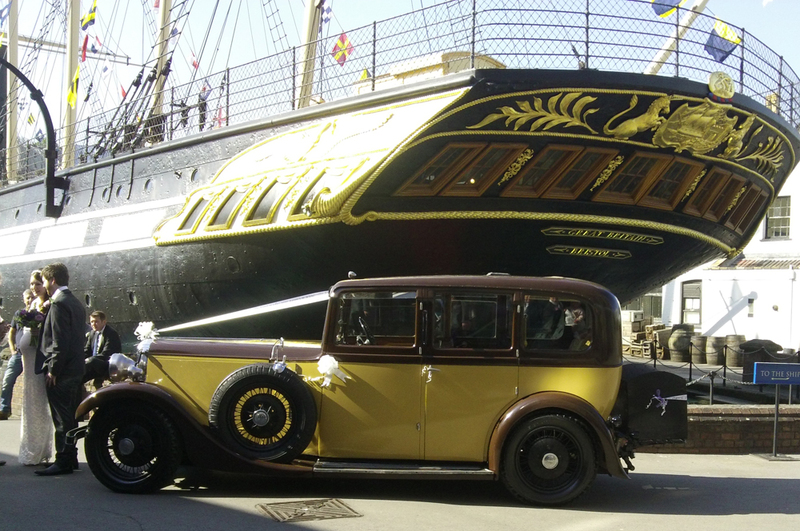 The official photographer seemed impressed with the Daimler and took many photographs, some even included the bride and groom! This year the LQ2-20 has been used mainly for short journeys and I felt as if the car could do with a good run to blow away the cobwebs. The Malvern 3 Counties Showground is the venue for a long running end of term event, I have been there on more occasions than I can count in various different old cars. If memory serves me right I have been in a Triumph Spitfire, Standard Flying Fourteen, Rovers P4 & P5 followed by many of the Daimlers seen on these pages. The forecast for Sunday 9th October 2016 was good and and lived up to expectations, I enjoyed the 120 mile round trip mile on A & B class roads in bright sunshine, the Daimler simply purring along at a steady 50mph, a speed at which it will cruise all day long. An hour into the journey I stopped for fuel and checked the water level, I was surprised to see that around a gallon was required to top it up. The show itself was great, a nice array of auto jumble and some lovely old cars, the Minis on display were wonderful, I had dozens of these of every type as a youngster, some were almost new, but none were as good as the ones at this show. Most had perfect panel gaps, and paintwork that would not look out of place on a Rolls Royce – very far removed from the uneven gaps and orange peel finish that I remember! The return journey was enjoyed in similar comfort in perfect conditions, I arrived home before dusk and ran the car into the garage as darkness fell. The warmth from the engine and smell of hot oil permeated the garage, making it a very pleasant environment that I was reluctant to walk away from! I have yet to investigate the cause of the water leak, but suspect a drip from a hose, the water is not getting into the sump, which is a big relief! Back home after a full day! Since the trip to Malvern, I have road tested the car and discovered a slight drip from a hose close to the water pump. I fitted a replacement clip and took the car for a good run, no coolant was lost. After four years of enjoyable driving, tinkering and careful conservation, I made the decision to sell the LQ2-20, this was not an easy one, the car fits in so well, it is large enough to appear imposing, yet light enough to be easy to drive and it fits nicely in the garage. However it was time for a change and the car has now moved on to Steve Wright, another enthusiast who has already covered many miles in the Daimler and even picked up a prize at a car show! I hope he and his family get as much fun out of AOX 662 as I have had. Just months after selling the car I am missing it, the ease with which it started, the smooth pleasant progress it made,the fact that the entire family could pile in and enjoy a day out, plus that certain indefinable ‘something’, that certain cars have, has made me realise that I really should have a Daimler LQ2/20 in my garage! If you have one, that you would like to sell, especially a saloon without a division, I would be very pleased to hear from you! Please use the form below to contact me.